In 1969 Virginia embraced the travel slogan Virginia is for Lovers and at various times during the last 45 years William & Mary geology students have emblazoned departmental t-shirts with Virginia is for Lavas and turned the iconic heart into a volcano. In that spirit, Geology Fellow Alex Johnson and I wrote a piece on the ancient lavas that once covered a large swath of what would become Virginia. What follows is an abbreviated version. Read the full version. 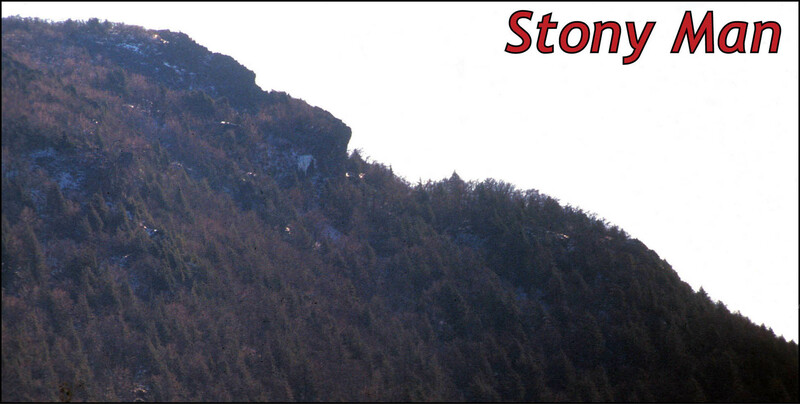 Stony Man is a high peak in Virginia’s Blue Ridge Mountains that tops out at just over 1200 m (4,000’). Drive south from Thornton Gap along the Skyline Drive and you’ll see the impressive cliffs of Stony Man’s northwestern face. These are the cliffs that give the mountain its name, as the cliffs and slopes have a vague resemblance to a reclining man’s forehead, eye, nose, and beard. Climb to the top and you’ll see peculiar bluish-green rocks exposed on the summit that are ancient lava flows, part of a geologic unit known as the Catoctin Formation. From the presidential retreat at Camp David to Jefferson’s Monticello, from Harpers Ferry to Humpback Rocks, the Catoctin Formation underlies much of the Blue Ridge. This distinctive geologic unit tells us much about the long geologic history of the Blue Ridge and central Appalachians. Stony Man’s summit and northwestern slope, Shenandoah National Park, Virginia. Cliffs expose metabasaltic greenstone of the Neoproterozoic Catoctin Formation. Geologic cross section of Stony Man summit area (modified from Badger, 1999). The Catoctin Formation was first named by Arthur Keith in 1894 and takes its name for exposures on Catoctin Mountain, a long ridge that stretches from Maryland into northern Virginia. The word Catoctin is rooted in the old Algonquin term Kittockton. The exact meaning of the term has become a point of contention; among historians the translation “speckled mountain” is preferred, however local tradition holds that that Catoctin means “place of many deer”. Origin of the name aside, the Catoctin Formation is a geologic unit that crops out over a large tract in the Blue Ridge region of Virginia, eastern West Virginia, Maryland, and southern Pennsylvania. Its current geographic extent does not, however, represent the original extent of the Catoctin Formation. In southern Pennsylvania and Maryland, the Catoctin Formation crops out in one contiguous area, but in Virginia there is an eastern and western outcrop belt of the formation. 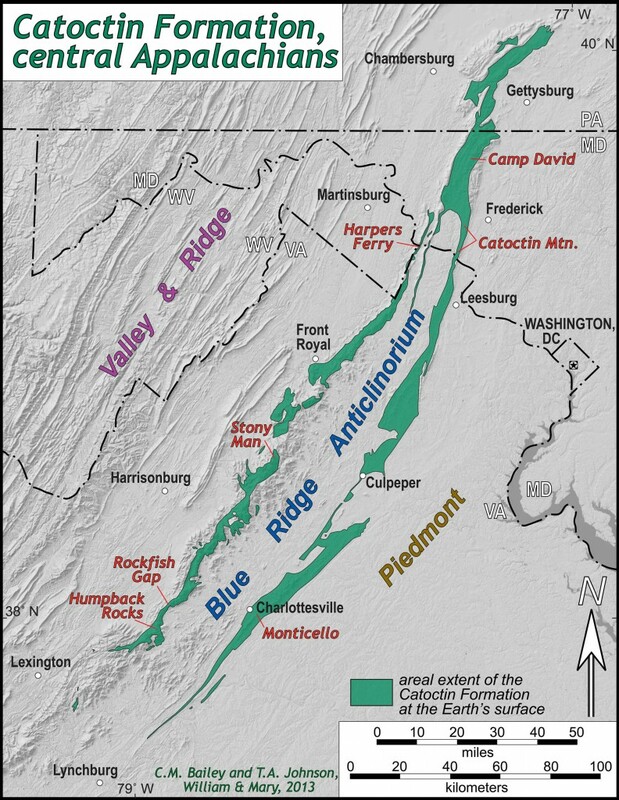 The Catoctin Formation is exposed on both limbs of the Blue Ridge anticlinorium, a complex regional-scale fold that has been breached by erosion thereby exposing older rocks in the center and younger rocks such as the Catoctin Formation along the flanks. Originally, the eastern and western belts were contiguous, but erosion has removed the younger Catoctin Formation to expose older rocks in the central Blue Ridge. Map illustrating the distribution of the Catoctin Formation in the central Appalachians. Column joints in the Catoctin Formation exposed along the Skyline Drive in Shenandoah National Park. The Catoctin Formation is composed primarily of metabasalt, commonly referred to as greenstone due to the rock’s greenish tint. When the basalt was metamorphosed, igneous minerals such as pyroxene, plagioclase, and olivine were converted to new minerals (chlorite, actinolite, and epidote), which give the rock its distinctive color. The Catoctin Formation also contains discontinuous layers of metasedimentary rock (including phyllite, quartzite, and even marble), as well as volcanic breccia and metarhyolite. 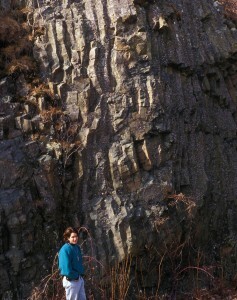 As the Catoctin lavas cooled, columnar joints developed in many flows. Columns form as the rock volumetrically contracts during cooling. As a lava flow cools, both from its top and bottom surface, these cooling cracks propagate inward, forming hexagonal columns. Columnar joints are best developed in lava flows that extrude onto a landscape. These columns are common in the Catoctin Formation’s western outcrop belt and indicate the flows were extruded on land. In contrast, at a number of outcrops in the eastern Blue Ridge, pillow lavas are preserved in the Catoctin metabasalts. Pillow lavas are bulbous to lobate masses formed as lava rapidly cools underwater, forming a glassy shell as the surrounding water quenches the lava. Pillow structures in the Catoctin Formation exposed along the south bank of the Hardware River in southern Albemarle County, VA.
How old are the ancient lavas of the Catoctin Formation? When did a vast volcanic plain cover the terrain that would become central and northern Virginia? Metabasalt dikes commonly intrude and cut older granitic rocks in the Blue Ridge, and in rare cases these feeder dikes can be traced upward into metabasalt flows that covered the granitic rocks. Based on these cross cutting relations, the Catoctin Formation is clearly younger than the old Blue Ridge granites that crystallized between 1.2 and 1.0 billion years ago. The Catoctin metabasalts are overlain by a sequence of sedimentary rocks that contain fossils including Skolithos, a distinctive trace fossil formed by burrowing creatures. These fossils are characteristic of sediments deposited during the early Cambrian period some 520 to 540 million years ago. 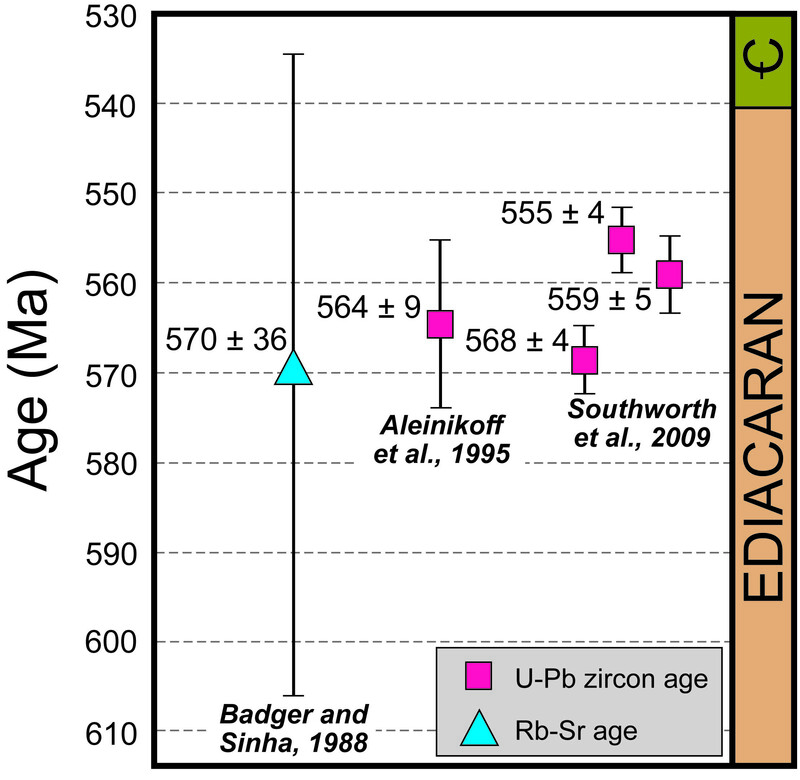 Graph illustrating isotopic ages and their associated uncertainty for the Catoctin Formation. Geologists have attempted to date the Catoctin lavas with varying degrees of success. 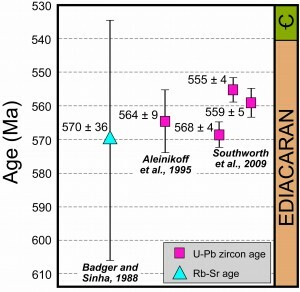 In 1988, Badger and Sinha reported a late Precambrian age of 570 ± 36 Ma for the Catoctin Formation based on the Rubidium/Strontium (Rb-Sr) dating technique, however this isotopic system can be readily disturbed by later metamorphism. Zircon is a high temperature igneous mineral that is ideal for geochronological studies. Zircon crystals invariably contain a small amount of uranium, a radioactive element that decays to lead at a constant and well-known rate. By comparing the ratio of certain uranium and lead isotopes in a given crystal, it is possible to discern how long the uranium has been decaying, and thus the age of crystal and, by association, the rock in which it is situated. However, silica-poor mafic igneous rocks, such as basalt, commonly lack zircons and thus cannot typically be dated with this technique. Yet, all is not lost as the Catoctin Formation is composed of more than just metamorphosed basalt; in northern Virginia, western Maryland, and southern Pennsylvania, metarhyolite is interlayered with the metabasalt. Rhyolites are felsic volcanic rocks that typically contain zircon and can be dated with the U-Pb method. Based upon U-Pb ages from metarhyolites in the Catoctin Formation, the extrusion of this volcanic complex occurred around 570-550 million years ago (Aleinikoff et al., 1995; Southworth et al., 2009) during the Ediacaran Period at the end of the Neoproterozoic Era. What is a sequence of volcanic rocks doing in the Blue Ridge? The Catoctin Formation is likely a continental flood basalt associated with late stage rifting that broke apart the Rodinian supercontinent and created the Iapetus Ocean. Flood basalts are large igneous provinces where low viscosity basaltic lava floods vast areas of the Earth’s surface. Due to the lava’s low viscosity, flood basalts are generally extruded quite rapidly, geologically speaking. In the case of the Catoctin Formation, more than 30,000 cubic kilometers of lava were extruded in a few million years. The origin of flood basalts is widely debated, however the most common explanation involves a combination of decompressional melting due to both continental rifting and the rise of a hot and expansive mantle plume. The origin of mantle plumes is also poorly understood, but likely involves a buoyant melt produced near the mantle-core boundary, which proceeds to rapidly rise through the mantle, melts other rocks, and drives extrusion of volcanic rocks at the surface. lithosphere and extruding onto the surface. Throughout geologic time, the cycle of assembly and dispersal of so-called supercontinents has been one of the most dramatic examples of plate tectonics at work. The supercontinent Rodinia is hypothesized to have been formed in the Late Mesoproterozoic and Early Neoproterozoic. At its core was Laurentia, a large landmass composed of what is now modern day North America, Greenland, and northern Scotland. As supercontinents are wont to do, Rodinia began rifting apart some 600-550 million years ago; the tectonic plates began to once again change direction and slowly drifted away from one another, forming new oceans and closing others. One of these new oceans that was created (and later destroyed during the creation of the most recent supercontinent, Pangea) was the Iapetus. The Iapetus formed between the eastern edge of the Laurentian craton and almalgam of tectonic blocks that would eventually be formed into what is referred to as Gondwana. It was during this period of rifting that the volcanic rocks of the Catoctin Formation were extruded on Laurentia’s margin. A key method by which geologists have discerned the cycle of supercontinent formation and dissolution has been through paleomagnetism, which is the study of the magnetic properties in certain minerals as means to reconstruct the past location of tectonic plates. Although paleomagnetism has played an integral part in developing the theories of plate tectonics and continental drift, paleomagnetism in old rocks is complex. Take for instance the plight of Rodinia, different researchers have constructed multiple iterations of the supercontinent’s configuration and location. 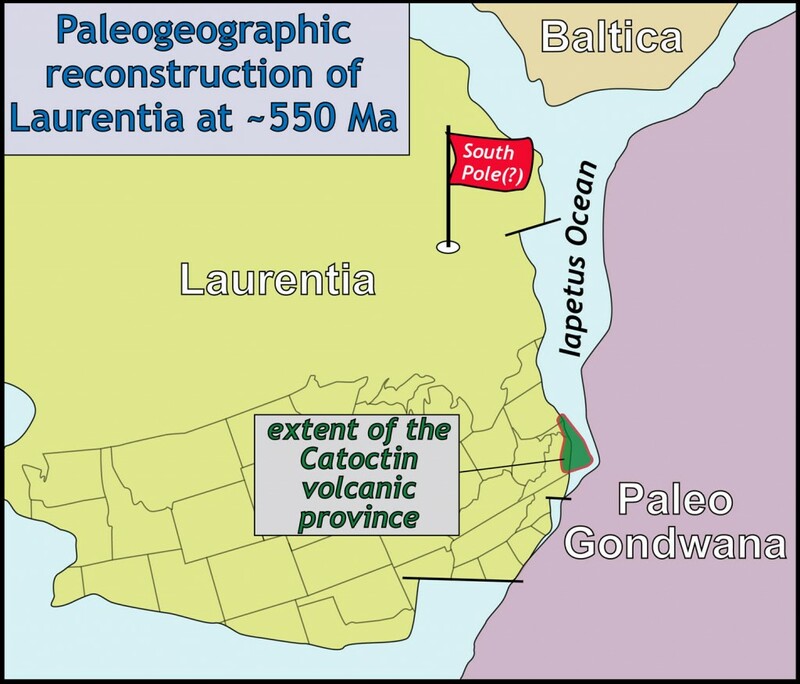 One study, focused on the Catoctin Formation in particular, place Laurentia near the South Pole at the end of the Neoproterozoic. Paleogeographic reconstruction of Laurentia and surrounding continents at ~550 Ma. Note Laurentia was in the southern hemisphere (data from numerous sources). How did a vast plateau of volcanic rocks that were buried beneath kilometers of shallow marine sedimentary rocks become the foliated greenstones that undergird the Blue Ridge Mountains? The answer to this question involves a complex history of deformation, metamorphism, and uplift. Recent geochronological studies indicate that the penetrative deformation and metamorphism, the tectonic event that produced the distinctive foliation in the Catoctin Formation, occurred between 320 and 350 million years ago during the Carboniferous Period. Some 20 to 30 million years later Blue Ridge rocks were thrust over sedimentary rocks of the Valley & Ridge province, during the collision that produced Pangea. The mountains produced during this collision likely rivaled the size of today’s Himalayas. In the million of years since their uplift, the Blue Ridge has slowly been beaten down with rounded ridges replacing rugged mountains. As the processes of weathering and erosion continued their interplay, different rock types eroded at different rates resulting in the modern topography of the Blue Ridge. Compared to the overlying stratified rocks and underlying granitic basement complex, the fine-grained metavolcanic rocks of the Catoctin Formation are particularly resistant to erosion. The great American author Nathaniel Hawthorne once noted “mountains are earth’s undecaying monuments.” Here in the central Appalachians much of that monument is shaped from the basaltic rocks of the Catoctin Formation, a unit birthed by fire during the breakup of ancient Laurentia and later changed to greenstone during the growth of the new Pangean supercontinent. I’ve hiked all over those mountains many times and never new what I was walking on! This stuff amazes me. Truly fascinating to think that great basaltic lava flows once covered ol’ Virginny! 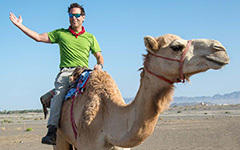 A well written and most enjoyable post!